About "Why Jesus? Booklet (Pack 10) (Alpha Course)"
Designed as a follow-up to the Alpha Course, this lively and challenging book is a 9-part study of Paul's letter to the Philippians. It offers a clear and powerful guide to living the Christian life to the full, with a new heart, new purpose, new attitude, and new confidence! Alpha pioneer Nicky Gumbel delivers a complete set of 29-minute Alpha talks for a new generation. Filmed live at Holy Trinity Brompton, London, these much-awaited videos will provide the definitive version of Alpha talks for tens of thousands of churches of all denominations around the world. Session 1 - Is There More to Life than This? Session 2 - Who is Jesus? Session 3 - Why Did Jesus Die? Session 4 - How Can I Have Faith? Session 5 - Why and How Do I Pray? Session 6 - Why and How Should I Read the Bible? Session 7 - How Does God Guide us? Session 8 - Who is the Holy Spirit? Session 9 - What Does the Holy Spirit Do? Session 10 - How Can I Be Filled with the Holy Spirit? Session 11 - How Can I Make the Most of the Rest of My Life? Session 12 - How Can I Resist Evil? Session 13 - Why and How Should I Tell Others? Session 14 - Does God Heal Today? Session 15 - What about the Church? NICKY GUMBEL is the pioneer of Alpha. He read law at Cambridge and theology at Oxford, practised as a barrister and is now Vicar of HTB London. He is the author of many bestselling books including Questions of Life. He and his wife Pippa write a daily online commentary on the Bible In One Year. The Alpha Film Series is designed for today's audience. It was filmed all around the world, and features interviews with world-famous leaders and inspiring stories. Two new hosts, Toby Flint and Gemma Hunt, join Nicky Gumbel to unpack the basics of the Christian faith in an updated and engaging way. Repackaged for today's audience, the Alpha Film Series is emotive, engaging and epic in scale and scope. 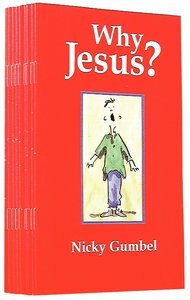 Nicky Gumbel and two new presenters, Toby Flint and Gemma Hunt, walk through the basics of the Christian faith in a way that everyone can relate to. The episodes feature inspiring stories and interviews from all around the world, as well as visual illustrations and motion graphics.